Union Railway Budget, that was expected to pour fresh blood to the legendary Toy Train of Darjeeling and Sevok-Rangpo hill rail track along turbulent river Tista, rather poured water to the dream of Northern West Bengal and Sikkim. “We are truly proud of this (World heritage status) and are committed to take measures to preserve them (Mountain rails) in good shape and health,” said the railway minister Mr. P K Bansal in his budget proposal. But he did not come with anything specific for the revival of the shattered health of Darjeeling Himalyan Railway(DHR). Despite of its being a world heritage site, the railway is still a major loss making part of North East Frontier Railway, “It incurs a financial loss of around Rs 10 crore per annum,” informed NF railway officials. After a decade of its being inscribed a world heritage site, mismanagement, financial loss, lack of social development and natural calamities etc put together has put the site into deep trouble. The Rail budget proposal did not come with any fresh proposal for financial back up to the ailing hilly track. “From the tourism point of view, we would be too happy if Railway Minister could propose some concrete development plan for DHR,” said Mr. T. Roy, Secretary of Eastern Himalayan Tour and Travel Operators Association. 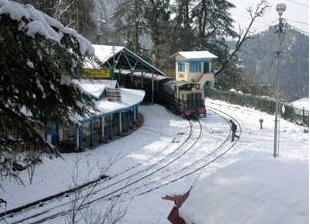 Mr Bansal did not propose any fresh fund allocation for another ambitious hill Rail track to Sikkim. The proposal for survey of Rangpo-Sikkim Broad Gauge rail route, as extension of proposed Sevoke-Rangpo route, was announced earlier. “This can bring great boost for entire Himalayan state Sikkim now dependent on its lifeline, geologically critical NH31A,” said Sikkim Chief Minister Mr. Pawan Chamling. “The track could be a major facilitator for Sino Indian trade after Nathula Pass in Tibet border starts functioning full-fledged,” said Mr. P K Shah, Vice Chairman of CII North Bengal chapter. The picturesque tiny Siliguri- Gailkhola, track that used to run in early 20th century was literally vanished beneath turbulent hilly river Tista in 3 devastating earthquakes during 1912- 1951. From surface level at Siliguri, the 40 km track used to climb up to a small station at Gailkhola, near Rangpo in Sikkim, along the west bank of Tista with lash green high hills in both sides. Many technical experts however expressed their skeptical views over the rationality and techno economic possibility and viability of the broad gauge track instead of making it narrow gauge along the serpentine hilly and ecologically fragile terrain. The simple act of writing down your idea and outlining how the business will operate can be helpful to ensure that you communicate your vision and that everyone is on the same page. It also helps you benchmark and check your progress as the company grows. A business plan is crucial to get support for your vision because it shows that you have thought through an idea clearly and aren’t just winging it. For example, I once wrote an entire business plan with a business partner on paper towels. We recognized an opportunity, but had to write it down and test the idea to make sure it would work (we didn’t have any paper handy, although that didn’t stop us). The plan was just for us, but we still had had to see if the vision, the financials, and the strategy were sound. We created that company and it went on to gross millions of dollars a month. In other words, your business plan doesn’t have to be some manicured document in order to make it successful. Now with this example keep in mind that I didn’t need to raise capital for this company and I had existing expertise in this industry. I’m certainly not advocating people draft business plans on paper towels! However, even with capital and expertise, it was still important to write out our idea and create a business plan. Otherwise, the company could have lacked direction and structure. Your business plan should be clear and provide a roadmap for your company. Without a plan, you’ll find it more difficult to communicate your vision and see a path to growth. As Finance Minister Chidambaram prepares to present his Budget, the UPA will be hoping he recreates the magic of his ‘Dream Budget’ of 1997. That exercise may have finally fallen far short of the promise it held, but the Government could do with even a short-term feel-good exercise. It will not only counter the negative political image the UPA has developed in recent months, but could also help create an environment that would revive the ‘animal spirits’ in investors. In trying to recreate the popular approval he received 16 years ago, Chidambaram will have to come to terms with the many changes that have taken place since then. In 1997, there was little ambiguity about the reform wish-list of the different stakeholders. Chidambaram just had to meet the diverse demands — even if it did not all add up — and it became everyone’s dream budget. In contrast, today, at least some of the clarity on what constitutes an ideal reform has been lost. We were told for months, if not longer, that allowing foreign direct investment in multi-brand retail was the signal global investors were waiting for. The Government absorbed the political pain that went with the decision in the apparent belief that it would mark a turning point in the attitude of foreign investors to India. But if there has been any such dramatic turnaround in investor attitudes, it remains an extremely well kept secret. While there may have been the predictable statements of appreciation from industry, the mood of foreign investors remains deeply apprehensive. This disdain about the Indian economy is not confined to foreign investors. Indian investors are just as keen to invest abroad rather than in India. This tendency to prefer foreign locations for a significant portion of their investments extends from major Indian business houses taking over global brands in the developed world to smaller Indian exporters. The problem then is not one of whether the Government allows foreign investment in one sector or the other, but the conditions that investors face in the Indian economy. The Budget has to address the fact that the costs of doing business in India are too high for investors of all hues. Unfortunately, the discourse over the costs of business in India has been preoccupied with two elements: The macro problem of inflation and the micro one of dealing with corruption. While it can be no one’s case that these are not important factors requiring close attention, the focus on them has been so overwhelming that little attention has been paid to an equally critical question: Is there anything about the reform strategy that has contributed to the rising costs of doing business in the country? It is becoming increasingly evident that the reform process has been less sensitive to the relative costs of doing business in India than it should have been. Much of the attention has been confined to a single indicator: The rate of inflation. The preoccupation with the inflation rate has been so complete that the Government has not hesitated to use anti-inflation measures, such as high interest rates, that increase the costs of doing business. There has been little attention paid to developing a strategy against inflation that is more sensitive to costs. The insensitivity to costs has, arguably, had its greatest impact on India’s original advantage of relatively cheap labour. The reformers have been so keen to develop infrastructure that foreign investors will feel at home in, that little attention has been to the costs of that infrastructure. This high-cost infrastructure has typically been concentrated in a few cities. The reform process has then insisted that the user must pay for this higher cost infrastructure. This raises the costs of living in cities with the infrastructure. If the wages rise fast enough to meet this increase in costs, the labour costs become greater than the alternatives available to foreign investors. And if the wages do not cover the higher costs of living in the cities, the workers are less likely to come to live in them. Without adequate labour available at a relatively low cost, there is no reason for investors — foreign or Indian — to prefer this country over its competitors, whether it is garment manufacturing in Bangladesh or Business Process Outsourcing in the Philippines. A 2013 version of the dream budget would then break out of the foreign-versus-Indian-capital dogma of the liberalisation debate so far and focus on the challenge of reviving the cost advantage that India needs to attract investment of all hues. Whether this is done by making major Indian cities more welcome to labour or by developing new centres are matters of detail. The Budget must demonstrate that the Government is willing to look for innovative instruments to make the Indian economy more attractive to investors. In order to do so, the Government must acknowledge that among the many changes that have taken place since the reforms began, the strategy of simply opening up the economy has lost much of its potency. Most of the low hanging fruits of the reform process have been plucked. As it evaluates the more uncertain options, the Budget must be willing to recognise that, like the Nehruvian ideology before it, liberalisation too can outlive its utility.